Shortly before Christmas 1962, a letter arrived at the White House from Moscow. "Dear Mr. President," it began. "It seems to me…that time has come now to put an end once and for all to nuclear tests, to draw a line through such tests." The letter was signed, "Sincerely, N. Khrushchev." In this crucial piece of Cold War correspondence, the Soviet Premier indicated that his nation was willing to move toward a more stable relationship with the West. Seven months later, President John F. Kennedy delivered the speech, " A Strategy of Peace," at American University. He called for a nuclear test ban treaty, which would suspend all atmospheric testing of nuclear weapons. Kennedy spoke loftily of peace, both securing and building it - "not merely peace in our time but peace for all time," he said. It was a clarion call to all nations to abandon nuclear strategies in favor of peace. The speech, delivered at AU's 49th Commencement on June 10, 1963, and written by Kennedy's primary speechwriter, Ted Sorensen, is known as one of Kennedy's finest orations. Fifty years later, the speech still resonates both for its unabashed desire for peace and its unequivocal condemnation of war. The legacy of the speech is evident today in the country's current nuclear policies and efforts to reduce the world's nuclear stockpile. For 13 tense days in October 1962, the United States found itself at the brink of nuclear war. The Cuban Missile Crisis brought into sharp focus just how serious the threat was. "The two leaders - Kennedy and Khrushchev - looked into the abyss and managed to avoid nuclear war," said School of International Service Dean James Goldgeier. "It was a pretty scary time." After the Cuban Missile Crisis, Kennedy resolved to prevent something like that from happening again. A nuclear test ban treaty seemed a good place to start. Kennedy revealed his agenda for the speech to few members of his administration for fear of a backlash. Striking a conciliatory tone with the Soviets would have been viewed as weak in many Washington quarters. Once Kennedy had the idea for the speech, he needed a venue. He was not originally scheduled to be AU's commencement speaker that year, recalled Anthony Morella, former dean of the Washington College of Law, who served as WCL Marshall in 1963. Pauline Frederick, a groundbreaking journalist and AU alumna, was scheduled to speak, but graciously stepped aside, Morella said, when it was learned that Kennedy was interested in AU as a location. After arriving on campus by helicopter from the White House, Kennedy spoke passionately for nearly 27 minutes about peace and the ways to achieve it. It was an "unusual" speech, said School of Communication Adjunct Professor Robert Lehrman. "Usually in a speech, the writing isn't that great. It's just a series of great moments or memorable lines," Lehrman said, a former speechwriter. Kennedy's American University speech was more than just a series of memorable lines. The writing was crisp, it expressed a view that was insightful, and it was hugely influential, all qualities of an exceptional speech, Lehrman said. The speech, which Kennedy and Sorenson finished reviewing and editing on a plane ride back from Hawaii that day, made use of a number of literary devices. It employed alliteration, antithesis, and repetition, none of which were common at the time in political speeches, Lehrman said. While the literary devices used in the speech were unique, the message was what made it shine. Rather than demonizing the Soviets, he reminded Americans of what they endured during World War II. He encouraged the American public to feel some sense of empathy toward their enemy. And he implored the nation to move forward. It was no wonder he kept the contents of the speech from all but his closest advisors. "It was a bold move by Kennedy to give that speech," said School of Public Affairs Distinguished Professor James Thurber. "The hawks did not like the speech, but it showed great leadership to make the world a safer place." School of Communications Professor Dotty Lynch remembers watching the speech as a young teenager. "It put AU on the map," she said. "It made the school stand out as a place of leadership." The legacy of Kennedy's speech at AU cannot be underestimated. 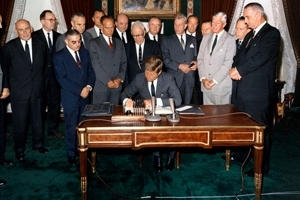 The détente policy, developed during the Cold War to help ease tensions in U.S.-Soviet relations, was a direct outgrowth of the speech, Goldgeier said. That policy lasted until the Soviet involvement in Afghanistan in 1979. "There was generally a notion that even though the Soviets were our adversaries, we would reach out to them," Goldgeier said. Over the years, the United States has continued to push for a worldwide reduction in nuclear arms. President Bill Clinton tried, albeit unsuccessfully to put a comprehensive nuclear test ban treaty in place. It was adopted by the United Nations General Assembly in 1996, but has yet to be fully ratified. The United States remains one of the few holdouts. Still, President Barack Obama is taking nuclear arms reduction seriously. In 2010, he and Russian Prime Minister Dmitry Medvedev signed the New Strategic Arms Reduction Treaty. In his latest State of the Union address, Obama spoke of nuclear disarmament. "We will engage Russia to seek further reductions in our nuclear arsenals, and continue leading the global effort to secure nuclear materials that could fall into the wrong hands - because our ability to influence others depends on our willingness to lead," Obama said. On May 23, Obama called on the nation to reexamine the fight against terrorism, outlining plans for tighter rules for drone strikes and renewed plans to close Guantanamo Bay prison in Cuba. "This war, like all wars, must end," Obama said. "That's what history advises. That's what our democracy demands." A direct thread runs from Kennedy's speech through Obama's agenda for nuclear arms. While the U.S. still has enough nuclear weapons to cause major damage, the reductions in recent years have been steep. That takes real leadership, said Thurber, and it started with Kennedy. "Despite what had transpired prior to the speech, Kennedy was still willing to reach out and work with the Soviets to reduce nuclear testing and weapon development and that's important historically and it's impressive," Thurber said. "This is all a part of the Kennedy legacy to reduce the number of weapons and increase peace in the world." Update December 20, 2013: The Eagle Extra published the day after Kennedy's death and AU's memorial service.